I’m sure there is some body posi (body positive) blogger rule that says I’m not supposed to say that but I can’t deny the truth. My fellow bloggers (and heroes) are posting pics of themselves in bikinis, meanwhile, I’m hyperventilating over the thought of the world wide web (or in reality, the 20 people who read my blog) seeing skin north of my chubby knee. I didn’t always hate shorts. When I was 6, I could’ve cared less. But somewhere around the junior high age, I started to care. I always felt uncomfortable in shorts, but growing up in the heat of West Texas, I was also sometimes uncomfortable NOT in shorts. As crazy as this may sound, I can remember the last pair of shorts that I actually liked. I think I was in 9th grade – in one of my rare “skinny” stages (probably only because I hit a growth spurt and my curves needed time to catch up). I went to Dillard’s and spent my hard-earned, dry-cleaner money (literally, I worked at a dry cleaners) and found a pair of black, Guess shorts with a button fly. It’s weird that I remember that, right? But seriously, aside from volleyball and basketball shorts, that was the last pair I wore for a long time. Fast forward to 2015. I am heavier now than I’ve ever been but I’ve also had 20 years to figure out that some things in life just don’t matter. What other people think of how I look in shorts is one of those things. I can’t say that I’m now 100% comfortable wearing them, but I’ve definitely come a long way. As proof, I offer the pictures below. I don’t like me in shorts either, so I feel your pain…but you and I both LOVE our dresses and with bicycle shorts my fat thighs don’t sweat!!! Problem solved! Yes girl! We do LOVE our dresses!!!! Is it just me or is it 10x harder to find a pair of shorts to fit you right than a pair of jeans? Maybe it’s just me, but I find that they are either too low cut on the waist, too snug in the thigh region, or they’re just too damn short. I mean, I see booties hanging out everywhere this summer. It’s not a good look no matter how nice your booty is, you know? Good for you though to be honest. It’s definitely not just you! 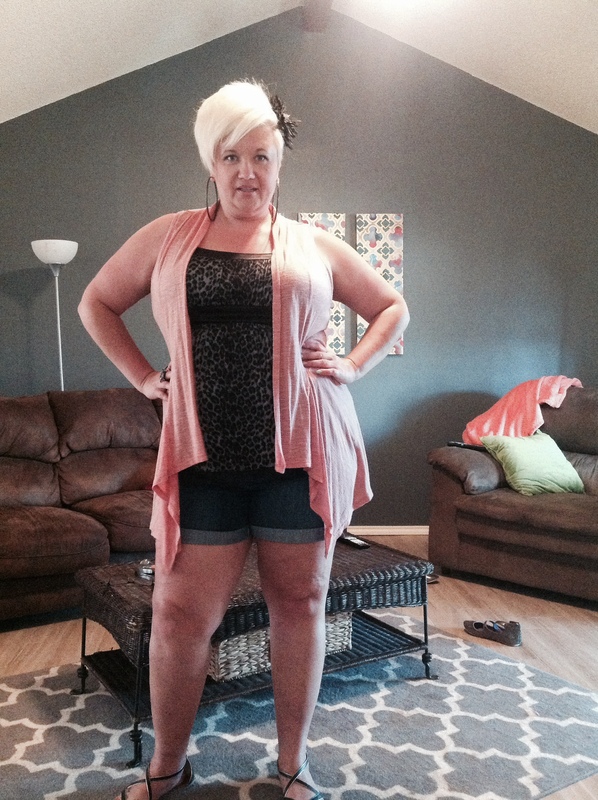 I was thinking that very thing in the dressing room the other day…and I was trying on PLUS SIZED shorts! I finally found a pair but there might have been some curse words along the way 😉 Thanks for reading, one-sixth geek! Curse words are to be expected on a shopping trip for shorts. Absolutely. Ha-ha. My boyfriend just couldn’t understand what was taking so long and why we had to go to different places too. That’s because they only have to worry about their shorts fitting their waist! If only I were a guy. Lol. You’re very welcome! Thanks for following! Right?! I’d like to think that they worry about more too. I dislike shorts because I have bad blood flow (thanks, mom) and I don’t want to show my varicose veins. Seen enough people with those in Berlin who use shorts anyway. So next year I’m going for it too! Good for you, wearing those! Looking awesome! I have varicose veins too but they are on the back of one calf and so I sort of forget they are there. Thanks for the compliment! I felt this way but got over that hurdle a couple of years ago. Accepting yourself is a journey, thanks for the honesty. Keep challenging yourself. Absolutely, Dasha! My next challenge – a bathing suit pic!!! I have complete faith that you’ll rock our socks off!! !